One of the characteristics of the period of Quietism is that the Quaker community was governed by a code of Discipline, which is to say a code of conduct. Williams sums up some of the code on page 126 with items that include prohibitions on alcohol, tobacco, cursing, failure to read scripture regularly, and others. I have read a number of Disciplines from this period in a book called ‘The Old Discipline’ and I think Williams’s description is accurate. I would even suggest that the Disciplines of the time were more thoroughgoing than Williams indicates. My first comment is simply to observe that today the book that governs a Quaker Yearly Meeting is likely to be called ‘Faith and Practice’. And it is unlikely to contain anything like the kinds of restrictions on everyday behavior that were the norm during the period of Quietism. This shift from a ‘Book of Discipline’ to a ‘Faith and Practice’ reflects a shift in the nature of the association. For both liberal and evangelical Quakers the feeling is that the disciplined life that was the norm under Quietism was too confining and lead to a loss of membership and energy; this is what Williams means by his remark deploring the loss of so many ‘substantial families’ of Quakers. This negative assessment of the Discipline is something that both liberal and evangelical Quakers share; they feel they have overcome and advanced beyond such an approach. My second comment is that I think if one compares the function of discipline in a non-Quaker context a different way of looking at this period emerges. By ‘discipline’ I mean a written code of conduct which members of an association are expected to adhere to if they wish to remain in good standing. The clearest example I can think of that instantiates this kind of social arrangement is monasticism. Christian monasticism is governed by a rule, such as the ‘Rule of Saint Benedict’. The rule outlines the basic parameters of a monastic life including codes of conduct, required observances, offices, and formation. What is remarkable about Christian monasticism is its tenacity over time. Though at times there have been strongly anti-monastic currents in Christian history, such as the English reformation, overall Christian monasticism has been able to survive and even flourish into the modern period. Although membership in specific orders that are governed by specific rules, or disciplines, has fluctuated, up and down, over the centuries, even so the monastic presence has been remarkably enduring. Buddhist monasticism is another example of an institution of remarkable endurance. It has maintained its presence in the world, in basically the same form, for about 2500 years. Buddhist sects have come and gone; East Asia is littered with the archeological remains of temples and monuments; but Buddhist monasticism has retained its integrity and an identifiable continuity over the millennia. Buddhist monasticism is governed by a rule, a code of discipline called the Vinaya. It is six volumes and meticulously governs the lives of Buddhist monastics in great detail. There are other examples, but these two are illustrative. My point here is that Quaker historians tend to view the period of Quietism, and its Disciplines, through the lens of modern day hyper-individualism. They therefore conclude that the overall effect of the Discipline must have been a negative one because it impinges on individual expression which is the highest good to which modernity aspires. (I think it was Ross Douthat who noted that the only ‘ism’ that contemporary people believe in is ‘individualism’.) Unable to note the similarities between a Discipline governed life in other social contexts, and the Quaker Discipline of the period of Quietism, the analysis of its effects, by both liberal and evangelical historians, strikes me as shallow and off the mark. Given that there are types of rule-bound, disciplined life that have lasted far, far longer than the way outlined in Quaker Disciplines, the question that really needs asking is why was this focus on Discipline lost among the Quakers when it was not lost among the Benedictines, or the Carthusians, or the Theravada Buddhists? I don’t have an answer; but I think it is a question that needs raising; my hope is that by asking such a question some light might be shed on the process that undermined the Quaker Way of life. It is worth noting, I think, that a rule-bound, disciplined, life is not confined to monasticism. One can also find it among Anabaptist groups such as the Amish. Among the Amish the ‘Discipline’ is referred to as their ‘Ordnung’; and it is, perhaps, the closest analog to the Quaker Discipline of the period of Quietism. Amish Ordnung govern many aspects of behavior, establish the Order of Service, describe how to choose ministers and bishops, and how violations are to be handled. Violations can result in expulsion from the Amish community, just as violations of a monastic rule can result in expulsion, just as violations of a Quaker Discipline could also end in being ‘written out of the Meeting’. The Amish were able to retain their approach into the modern period, but Quakers, by and large, were not. It seems to me the question that historians should ask is why Quakers lost their Discipline. I am particularly interested in hearing the voices of those who defended a traditional Quaker way of life; that is to say a way of life under a code of Discipline. I mean, when the evangelicals and liberals were altering that way of life, what did the traditionalists have to say? What was their point of view? It is difficult to find out what their perspective was because Quaker historians today do not seem to be interested in letting them speak to us. Having decided that the Discipline is something we are better off without, there is no need to allow contrary voices to speak. I think this is a loss and, personally, I would like to hear what the traditionalists had to say as they saw the Quaker Discipline slipping away. - Yes, I'm partial to the value of self-discipline in various forms because there are things we don't get to discover about ourselves until we do that. We may think we are this or that or wouldn't do this or that or don't need this or that vice -- but try and do without it and see! We learn unexpected things in this practice of discipline of some sort (positive forms anyway), and only when we do without what we wanted to do or have first. Any decision to disregard these practices at the outset will simply leave us more spiritually poor and ignorant of our own issues. - "Among the Amish the ‘Discipline’ is referred to as their ‘Ordnung’; and it is, perhaps, the closest analog to the Quaker Discipline of the period of Quietism." The film I watched was saying that the very old German maybe like us trying read something in very Olde English where the most you can hope for is memorization but they don't actually get to read and understand the Bible. The Ordnung even required (by common interpretation), strangely, that the Amish people not actually read the Bible themselves, but trust in their elders and the Ordnung and follow the disciplines at all cost without pursuing the truth one's self (seen as the individualism which they clearly don't believe in). Some Amish have thus actually been excommunicated for reading the Bible themselves. Basically I think this is (or was at the time of the documentary) the common practice in the rare cases where someone sneaked to read the Bible themselves and didn't recant or something. They actually get shunned for reading scripture. So for this reason, I hope that the Quaker disciplines bear no resemblance to the Amish disciplines and it's an uncomfortable thought if they do! I would like to learn more about the Quaker disciplines you speak of, to understand if they were actually repressive or just empowering. A friend has advised me that I could be a bit wrong about my generalizations about the Amish here so ha ha as soon as I have said "don't define other people for them" I have done so and done it wrongly. I am going to see if Timothy Bruffy may have any insight or information on this. The Amish Elders and Bishop decide upon any changes to the Ordnung. Anyone that speaks against the Ordnung is Warned once, or Shunned and or placed in the Ban also. . .depending on the offense. Unity is in Uniformity to them. Speaking for one's own, instead of the entire gemeinschaftheit ~ Community is frowned upon. They avoid individualism that is true. Yet, there have been ladies to speak up already, without a shunning. Old Order Amish are not merely Old Order Amish. . . There are the Swarzentruber Amish, Nebraska Amish, Troyer Amish, Renno Amish, and many other groups. Grey buggies with White or Yellow tops are typically more Traditional. Excommunication is due to a member violating the Ordnung without or refusing to publicly make amendments by Kneeling Confession, as it used to be referred to. Hope this helps any of thee. It seems to me that you'd been reading some of their founding leaders -- and found that it hasn't always been this way. That reading "in the Spirit" was the original intention. Jacob Amman wrote little to nothing at all, and he was the founder of the Amish Brethren in 1693, in Alsace/Loraine and a Tailor by trade. The Spirit was the Light that enlightened the men and Elders to conclude decisions that would safeguard their communities from the World, which they are to 'come out of' and also 'be separate' from. English Bibles, for reading in the home and in their homes: which their Meetinghouses are either their Barns or Houses. . .'House Amish'. High German Bibles is the norm, and a great many do not know High German. . . Thus, in some Districts with extremely strict Ordnung of Shunning and Banning; they may well Shun for other 'outsiders' holding Bible Studies etc. Invent conclusions. . .those conclusions are found within the Heilige Schrift and adapted into the Ordnung. Inconvenient? Nay, as all, by in large, read to for the betterment of the entire Community and adhere to the Ordnung which is NOT written down as other Anabaptist Tribes. I question many of the statements made here about the Amish and the Bible. As Timothy Bruffy noted, there are many varieties of Amish. What may be true of one group will not be for another. Reluctance to encourage the average church member to study the Bible usually stems from fear of the disruption that can occur in a church when a hundred "experts" are offering different interpretations. The Bible has been translated into Pennsylvania Dutch, so it is available in everyday dialect for those whose High German is non-existent or rusty. Jim Wilson wrote: " I mean, when the evangelicals and liberals were altering that way of life, what did the traditionalists have to say? What was their point of view? It is difficult to find out what their perspective was because Quaker historians today do not seem to be interested in letting them speak to us. Having decided that the Discipline is something we are better off without, there is no need to allow contrary voices to speak. 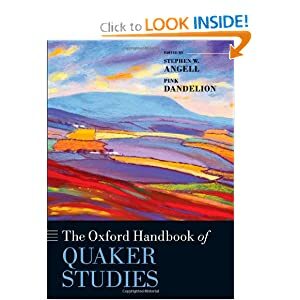 I think this is a loss and, personally, I would like to hear what the traditionalists had to say as they saw the Quaker Discipline slipping away." Friends have produced a very large corpus of literature over three and a half centuries. It is true that modern Quaker historians tend to emphasize some "threads" (to use a computer term!) more than others and that, as a group, they have some significant biases. They tend, for instance to emphasize Quaker involvement in issues of social reform and social change, at the expense of a focus on spiritual life, which was once the core of Quaker spirituality. These liberal biases would not prevent anyone interested from exploring the literature of Quaker traditionalism for themselves. Personal Note: I am putting the finishing touches on "Ann Branson and the Eclipse of Oracular Ministry in Nineteenth Century Quakerism", which I read earlier this month at the Center for Anabaptist and Pietist Studies. It explores the model of ministry upheld by classical Quaker tradition. I hope to submit it for publication soon. If this is of interest, you may wish to look at my earlier essay on "Cyrus Cooper's Memorial and the Free Gospel Ministry", published in the Spring, 2000, issue of Quaker History. If you want to explore even earlier Friends' history, see Rosemary Moore, The Light in Their Consciences, which investigates the first generation of Friends, from 1640-1660. Also take a look at Michael Graves, Preaching the Inward Light, which explores early Quaker preaching and sermons. Many journals and memoirs of earlier Friends are now being republished through modern printing technology. The literature of traditional Quakerism is available now more than ever before. And then use the Google Books site to explore past issues of the Philadelphia Friend. Cyrus Harvey's Western Friend may also be available through Google. Marietta addresses specifically the issue of discipline in Quietist Quakerism. The Amazon description of his work misinterprets "exogamy"; the Friends of that period insisted on "endogamy", not exogamy. In describing Quaker periodicals available on Google Books, I failed to mention the Friends Intelligencer and the Friends Review. Thanks, everyone, for your informative posts here. My understanding is that the Amish are diverse. I don't think there is any national organization that enforces uniformity. The local congregation, and perhaps associations of local congregations, seem to be the centers of authority and therefore there are variations in practice. From an outsiders point of view the Amish look the same, but from within the community the differences are significant. Among some of the newer Amish groupings, like Beachy Amish, I believe they use the King James Bible or the New King James Bible. These newer groupings are a small percentage, but they do have a presence. Timothy, thanks for the informative response. The different types of Amish make generalizations difficult; the quilt of Amish life appears to be complex. William, I appreciate the references listed and will follow up on a number of them. I want to add that I am aware that works from the period of Quietism are available. What I am referring to when I say the Quietists are misrepresented is how that period is presented in general Quaker histories, especially when those histories are written by liberal or evangelical Quakers. It is in these general histories that I feel a consistently distorted view is presented. I would like to be wrong about that, but as I slowly learn more and more from the period of Quietism, I reluctantly have come to that conclusion. Jim Wilson wrote: "It is in these general histories that I feel a consistently distorted view is presented. I would like to be wrong about that, but as I slowly learn more and more from the period of Quietism, I reluctantly have come to that conclusion." For an excellent study of Quaker ministry and spiritual life during the Quietist period, see Donald Green, "An Era of Transition, 1750-1840", in Francis B Hall, ed., *Quaker Worship in North America: A Faith and Life Study Book*. Donald Green was an Evangelical Friends pastor, who died at a young age in a tragic accident. His work probes the myths that are sometimes perpetrated about the spiritual life and activity of Friends during the 18th Century.